use summarization as a comprehension strategy to not only decode images and/or words but to use those images and/or words to construct meaning. Show students Rabbit Hunt and have them discuss what they see. Ask them what things in the painting they can identify. Ask them what they think is going on in the painting. Ask them if they recognize the landscape. Have they ever been to a place like the one shown in the painting? Share with students the information from the About the Art section, as appropriate, and find the items from the “Details” section ofAbout the Art. Explain to students that they can use the same summarization techniques they use in reading to discuss art. They will work in groups to create a summarization pyramid. Divide students into groups of 4–5 and have them draw a pyramid shape on paper. Where is the scene located? Who is present in the scene? What action is taking place in the scene? Who might be part of the story but is not present? What other titles might fit this painting? What is a question you have about the painting? What are three things you see in the painting? What is a news headline you could write about the painting? What are four things happening in the painting? What other topics are related to the action of the painting? What cause and effect relationship do you see in the painting? What are some reasons we should know about this painting? What is your personal opinion about the painting? When does this painting take place? What clues tell you that? After looking at the painting, have your ideas about anything changed? What is the title of this painting? How many colors can you count? What do you think is happening in the painting? What do you think the people are saying to each other? How do you think the weather feels in this painting? Would you like to be in this painting? Does it look like a place you have been before? Working in groups, students will observe the image of Rabbit Hunt and write the answer for each prompt on their note paper. From their list of answers, students will fill in each line of their pyramid with the answer that best fits the length of that line. For instance, a short answer such as the title would go on the top line of the pyramid. A really long answer, such as an answer to the question, “What is your personal opinion of this painting?” would go on the bottom line. Not all prompts will be re-written in the pyramid, just the ones that fit the shape. Each group will have different answers to the questions. The group should decide how to best develop their pyramid based on their responses.NOTE: Younger students could write all responses in a squiggly line or other design, rather than choose responses to form a specific shape.NOTE: Students who are not able to write could dictate to the teacher as the teacher writes their answers on the board. The teacher might choose to write their responses in a shape or just as a list. When students are finished, have a reporter from each group read their pyramid summary to the class. Decide if there is anything that was left of out the class descriptions that needs to be added to provide a thorough description of the painting. You might wish to display these pyramid summarizations in the class along with an image of Rabbit Hunt. Point out to students that this type of summarization allows them to gain a better understanding not only of art, but also of text. Students will observe and discuss Hennings’s painting Rabbit Hunt, choose a character from the piece, and write a narrative from that character’s perspective. 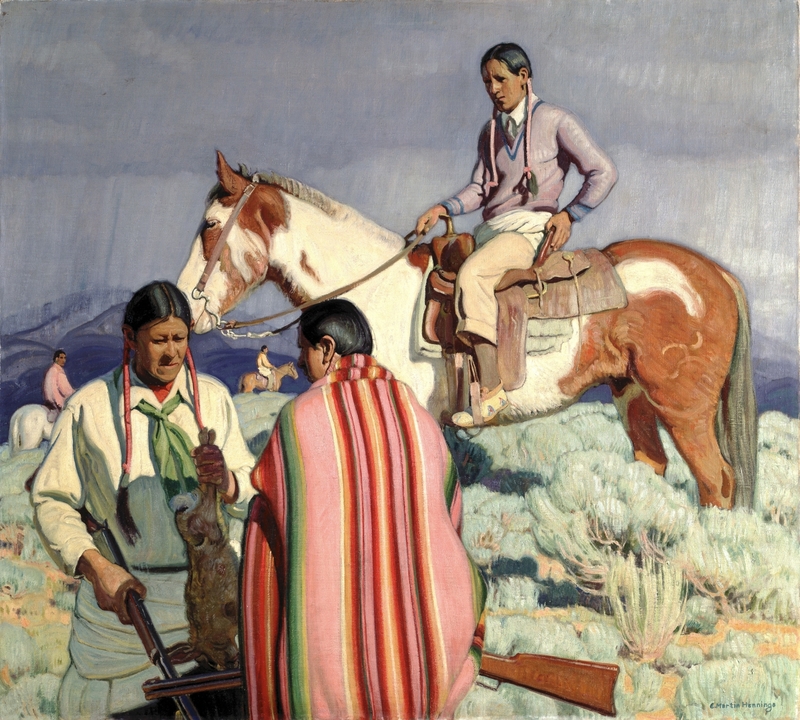 Students will examine and discuss Rabbit Hunt by E. Martin Hennings, paying particular attention to the fact that it is a plein air painting (meaning it was painted outdoors). Students will look at Hennings’s painting and play a counting game, then go on a hunt for the many colors found within. E. Martin Hennings was born in New Jersey and spent his childhood in Chicago. Inspired by a visit to the Art Institute of Chicago, he decided to become an artist at the young age of thirteen. He enrolled in classes at the Art Institute and eventually graduated with honors. He also studied painting at the Royal Academy in Munich. In 1917, Hennings visited Taos, New Mexico, on a summer trip sponsored by Chicago Mayor Carter H. Harrison, Jr. While there, Hennings found inspiration in the subject matter of the American West. He made Taos his home in 1921, joined the Taos Society of Artists in 1924, and remained there until his death in 1956. Hennings did most of his paintings outdoors but would often add finishing touches in his studio. He used many thin layers of paint, which required lengthy drying periods, so he would work on several paintings at a time. Hennings would never sign his name until he was completely satisfied with his work. The vertical patterns are most noticeable in the blanket and the braids worn by the men, but Hennings also used the patterns in nature: in the sky, the horse’s tail, and in the sagebrush. Dramatic light, bright color, and pattern activate this rather static scene. In spite of the dark, stormy sky, the sun throws hard shadows in the foreground. Bright light falls on the three men and the horse in the foreground of the painting, but the title subject, the dead rabbit, is obscured in dark shadows. Though the rabbit is hidden in the shadows, Hennings uses several techniques to signal its presence. All the men seem to have their attention focused on the rabbit and their rifles point to their recent kill. The vertical lines play another role here; if you follow the rider’s braids to the horse’s reigns to the other set of braids, your eye is led directly to the rabbit. Three men have a bold presence in Rabbit Hunt. Though they have quite individualized faces, we don’t know exactly who they are. Notice how each man is clothed in an individual way. The rider, for example is wearing a cross-cultural combination of trousers, a cuffed shirt, a tennis sweater, and moccasins. The diamond shape under the horse’s neck creates a frame for another horse and rider. At first glance there is only one horse present, but look a little closer and you’ll see there are three in this painting. Striped blankets were used all the time, but Hennings would have selected the colors, pattern, and position of the blanket to suit his vision for the scene. Bright colors are found throughout this painting in the highlights and shadows. Notice the bright red-orange near the horse’s hind leg, the yellow contours on the shadowed white clothing, and the light blue edges of the sagebrush in the center.